I had a fun day with my boys today. We took our bikes to our local bike trail to go for an afternoon ride. It was a beautiful day, warm, but a nice breeze, and fine for biking, especially with lots of shade. We packed a lunch in our backpacks. But we also brought along camping hammocks for each of us. We stopped in the middle of a long ride to eat our lunch. 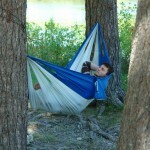 Then we strung our travel hammocks in a tree near each other and hopped in for a short rest! It was fun!